Welcome. Celebrating Life Ministries has given birth to a new community called Celebrating Mary's Grace! This new community, a subset of Celebrating Life Ministries, is modelled after Our Lady of Medjugorje, otherwise known as Mother Mary. Beginning in 1981 Mary has been appearing in a series of apparitions in a small village called Medjugorje in the country of Bosnia-Herzegovina. She tells us that God has sent Her to our world with a mission of prayer and peace. Leading this new community will be Rev. Virginia Chapin-Sheff, an ordained minister with Celebrating Life Ministries. Rev. Virginia has had numerous personal encounters with Mother Mary and has dedicated her life to helping fulfill Her mission. "The love and goodness of the Heavenly Father give revelations which make faith grow, for it to be interpreted, that it may bring peace, certainty and hope. In this way, I, too, my children—through the merciful love of the Heavenly Father—always, anew, am showing you the way to my Son, to eternal salvation. But, unfortunately, many of my children do not want to hear me; many of my children are of two minds. And I—I always, in time and beyond time, magnified the Lord for all that He has done in me and through me. "Dear children, my words are simple but are filled with motherly love and care. My children, all the more the shadows of darkness and deception are being cast over you, and I am calling you to the light and truth - I am calling you to my Son. Only He can transform despair and suffering into peace and clarity; only He can give hope in the deepest pain. My Son is the life of the world. The more that you come to know Him - the more that you come close to Him - all the more you will love Him, because my Son is love. Love changes everything; it makes most beautiful also that which, without love, seems insignificant to you. That is why, anew, I am saying to you that you must love a lot if you desire to grow spiritually. I know, apostles of my love, that it is not always easy, but, my children, also the painful paths are paths which lead to spiritual growth, to faith, and to my Son. My children, pray - think of my Son. In all the moments of the day, raise your soul to Him, and I will gather your prayers as flowers from the most beautiful garden and give them as a gift to my Son. Be true apostles of my love; spread the love of my Son to everyone. Be gardens of the most beautiful flowers. 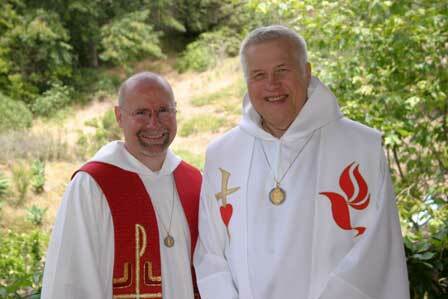 With your prayers help your shepherds that they may be spiritual fathers filled with love for all people. Thank you." "Dear children, I am calling you to accept my words, which I am speaking to you as a mother, with a simplicity of heart, so that you may set out on the way of complete light and purity, of the singular love of my Son, man and God. A joy - a light indescribable in human words - will penetrate your soul and the peace and love of my Son will take hold of you. I desire this for all of my children. Therefore, you, apostles of my love, you who know how to love and forgive, you who do not judge, you whom I encourage, you be an example to all those who are not going on the way of light and love or who have diverted from it. By your life show them the truth. Show them love because love overcomes all difficulties, and all of my children thirst for love. Your unity in love is a gift to my Son and me. But, my children, remember that to love also means to desire the good for your neighbor and to desire conversion of your neighbor's soul. As I am looking at you gathered around me, my heart is sad, because I see so little brotherly love, merciful love. My children, the Eucharist - my Son alive among you - His words will help you comprehend, because His word is life, His word makes the soul breathe, His word brings about cognition of love. Dear children, anew, I am imploring you as a mother who desires the good for her children: love your shepherds, pray for them. Thank you." "Dear children, all that my Son, who is the light of love, has done and does, He has done out of love. Also you, my children, when you live in love and love your neighbors, you are doing the will of my Son. Apostles of my love, make yourselves little; open your pure hearts to my Son so that He can work through you. With the help of faith, be filled with love. But, my children, do not forget that the Eucharist is the heart of faith. This is my Son who feeds you with His Body and strengthens you with His Blood. This is a miracle of love: my Son who always comes anew, alive, to bring life back to souls. My children, by living in love you are doing the will of my Son and He lives in you. My children, my motherly desire is for you to always love Him more, because He is calling you with His love. He is giving you love so that you may spread it to all those around you. As a mother, through His love, I am with you to speak the words of love and hope to you—to speak to you the eternal words that are victorious over time and death—so as to call you to be my apostles of love. Thank you." The visionary Mirjana Dragicevic-Soldo had daily apparitions from June 24th 1981 to December 25th 1982. During the last daily apparition, Our Lady gave her the 10th secret, and told her that she would appear to her once a year, on the 18th of March. It has been this way through the years. Several thousand pilgrims gathered in prayer of the Rosary. The apparition lasted from 1:38PM to 1:42PM. My children, pray for the strength of faith, trust in the Heavenly Father, and do not be afraid. Know that not a single creature who belongs to God will be lost but will live forever. Every pain has its end and then life in freedom begins there where all of my children come - where everything is returned. My children, your battle is difficult. It will be even more difficult, but you follow my example. Pray for the strength of faith; trust in the love of the Heavenly Father. I am with you. I am manifesting myself to you. I am encouraging you. With immeasurable motherly love I am caressing your souls. Thank you." "Dear children, when love is beginning to disappear on earth, when the way of salvation is not being found, I, the mother, am coming to help you to come to know true faith – living and profound – so as to help you to truly love. As a mother, I am longing for your mutual love, goodness, and purity. My desire is that you be just and that you love each other. My children, be joyful in your soul, be pure, be children. My Son used to say that he loves to be among pure hearts, because pure hearts are always young and joyful. My Son said to you to forgive and to love each other. I know that this is not always easy. Suffering makes you grow in spirit. For you to spiritually grow all the more, you must sincerely and truly forgive and love. Many of my children on earth do not know my Son, they do not love Him; but you who do love my Son, you who carry Him in your heart, pray, pray and in praying feel my Son beside you. May your soul breathe in His spirit. I am among you and am speaking about little and great things. I will not grow tired speaking to you about my Son – the true love. Therefore, my children, open your hearts to me. Permit me to lead you as a mother. Be apostles of the love of my Son and of me. As a mother I implore you not to forget those whom my Son has called to lead you. Carry them in your heart and pray for them. Thank you." “Dear children, I turn to you as your mother, the mother of the just, the mother of those who love and suffer, the mother of those who are holy. My children, you too can be holy-this depends on you. Those who are holy are those who immeasurably love the Heavenly Father, those who love Him above all. Therefore, my children, always strive to be better. If you strive to be good you can be holy even though you may not think so yourselves. If you think that you are good, you are not humble, and arrogance distances you from holiness. In this peaceless world full of threats, your hands, apostles of my love, should be extended in prayer and mercy. And to me, my children, give the gift of the rosary, the roses which I love so much. My roses are your prayers pronounced with the heart and not only recited with the lips. My roses are your acts of prayer, faith and love. When my Son was little, he said to me that my children would be numerous and that they would bring me many roses. I did not comprehend Him. Now I know that you are those children who are bringing me roses, when, above all, you love my Son, when you pray with the heart, when you help the poorest. Rev. Virginia Chapin-Sheff, MA is Director of the Celebrating Life Education Program and now the Co-Director, with Padre Paul Funfsinn, of the Celebrating Mary’s Grace community. For 20 years, Virginia taught spiritually centered classes privately, in her office, and at Salve Regina University. Virginia was also trained in multiple holistic modalities and had a private practice for 29 years. Her true calling, however, came into formation, at the age of nine, when she had a near death experience during which she had an intimate exchange with Jesus, an experience that would shape her entire life. Virginia’s devotion to Mary started in the 80’s when she was visiting the campus of Salve Regina University, in Newport RI, pondering whether to apply to the Graduate Program in Holistic Counseling. She came upon a large statue of Mary whereupon seeing it she fell to her knees and voiced “I will follow You.” She graduated from this program in 1992. Her second experience came in 1998, when she was visiting a bookstore and was emotionally stunned by a small statue of Mary. She bought the statue for a friend who was going through an illness. When she presented the statue to her friend in the hospital, her friend opened up her hand and revealed the same statue, the only thing she had brought with her. Even though her friend would pass, both of them felt the presence of the Beloved Mother surrounding them in Love and Protection. Upon traveling, in 2005, with Celebrating Life to the Casa of Dom Inacio, (John of God) in Brazil, Virginia was again mesmerized by a picture of the Beloved Mother that hung on the outside wall. 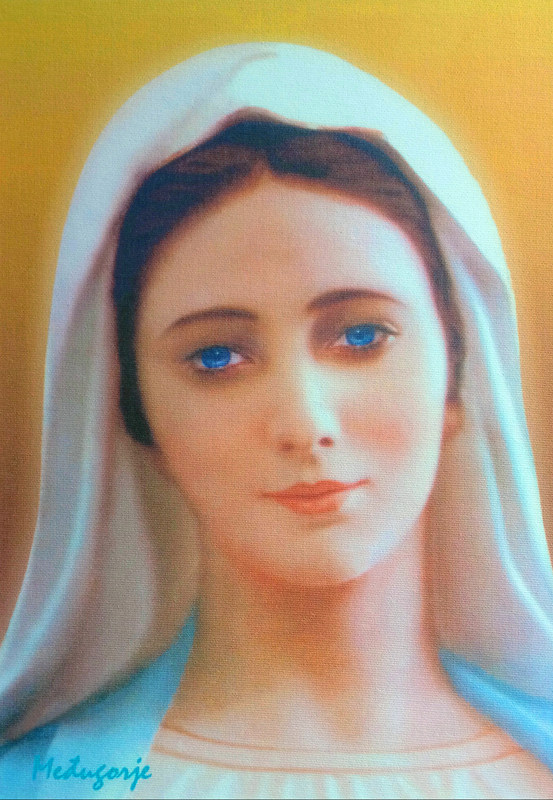 This picture so moved her that while sitting in the “current room” of this spiritual hospital, she would focus on images of Mary for hours on end while meditating. This has continued and Virginia still stares at Mary’s image in her mind and heart while meditating in current. In 2010, Virginia made her first (of many)pilgrimages to Medjugorje. On her second trip, six months later, Virginia felt an interior guidance to go to the house of Vicka, who is one of the visionaries who sees the Blessed Mother every day and is gifted with healing, where she miraculously received a private blessing on her head. The strange thing was Virginia did not know where Vicka lived, and was guided interiorly to the house. She experienced this blessing as a turning point. Shortly after, she was diagnosed with a brain tumor, a journey that deepened her dedication to give her life to Mary and Jesus. In January of 2014, she formally Consecrated her life to Mary. Over the years, multiple trips to Medjugorje, and to John of God have continued to deepen her Love of the Blessed Mother. The Celebrating Mary’s Grace community is dedicated to helping the Blessed Mother fulfill her mission on Earth, which is peace, love of her son, Jesus the Christ, love of our neighbors, forgiveness, faith, and prayer.